Couple of weeks ago I was looking for a simple backup solution and saw that Buffalo now has the TeraStation Pro II Rackmount available locally. The base model (1 terabyte) wasn't that expensive, but prices increased exponentially for the models with more storage, and the top model was 4 TB. After some googling, I found that the drives can be replaced with your own without much difficulty if there's no data on the drives. I did some calculations and noticed that if I get the 1 TB model and four 500 GB drives, the cost is exactly the same as buying the 2 TB model. So it would be like buying the 2 TB model, and getting four 250 GB hard drives for free! So I immediately placed an order for two TeraStations, and eight 500 GB drives. 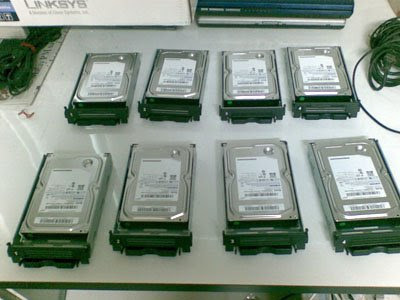 Each TeraStations came with four Samsung HD250HJ 250 GB drives, and they were replaced them with Western Digital RE2 500 GB drives, turning the base 1 TB (4x250) model into the 2 TB (4x500) model. Unfortunately, when it was time to put the new drives into the TeraStations, I noticed the screws locking the drives into the drive trays have little tamper-proof warranty stickers on them. Looks like my TeraStations won't be warrantied for three years. 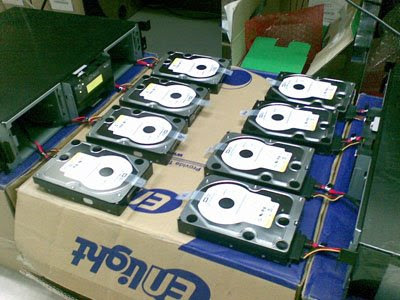 The Samsung drives pulled from the two TeraStations. Building the RAID after installing the new Western Digital drives.